November is Epilepsy Awareness Month. However, most people do not know about epilepsy, or have a preconception of what epilepsy is or what happens during a seizure. Epilepsy, as defined by Webster’s Dictionary, is “any of various disorders marked by abnormal electrical discharges in the brain and typically manifested by sudden brief episodes of altered or diminished consciousness, involuntary movements, or convulsions”. To simplify this definition, it is a seizure disorder, making Epilepsy a seizure disorder. Do you know 30 people or more? 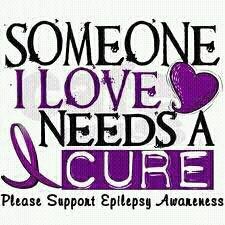 Chances are, you know an epileptic, as the statistics show that every 1 in 26 people is an epileptic. If one can assume that everybody knows at least 100 people, it is likely that somebody would know four. That is a large number, and if you do not think it is, think about this: the United States has a population of 316.1 million people according to the 2010 census. When you calculate out 1 in 26 people out of 316.1 million, you get just above 12 million people. That is a lot of cases. Still not convinced? The world’s population is 7.125 billion people. The math works out to be around 270 million people who have epilepsy. That is a crazy large number. When someone mentions epilepsy, most people ask one thing: “Do you get seizures from flashing lights? I guess I better not put on any strobe lights.” This is a big myth because a recent study shows that only 3% of all epileptics are photogenic, which means that the strobe light causes them to have seizures. Many famous people in history were epileptics. A grand master at strategy, politics and battle tactics, which lead to the conquest of Gaul and the transition of the Roman Republic to the Empire, Julius Caesar suffered from absence and complex partial seizures. Hugo Weaving, who plays the ‘Red Skull’ in Captain America, ‘Agent Smith’ in The Matrix, and Lord Elrond of ‘Rivendell’ in the Lord of the Rings trilogy, has been taking anticonvulsant medication since he had his first epileptic seizure at age 13. Socrates, the philosopher who influenced history and governments for ages, had temporal lobe epilepsy. In the football world, brothers Tiki and Rhonde Barber as well as Atlanta Falcons Running Back Jason Snelling have all been diagnosed with some form of epilepsy. Even in the music arena, rap icon Lil Wayne has admitted that he has had epilepsy since childhood. Many famous people in history were epileptics; probably more than you thought. Epilepsy is a disorder which affects many millions of people in America and across the world. However, so many people do not know anything about it. We have a huge deal about breast cancer awareness. Are brains not as important as chests? So this November, let us be aware of epilepsy. Let us learn more about it. Let us understand it, and therefore be able to understand those who have it. ← Should ISS be used for dress code violations?